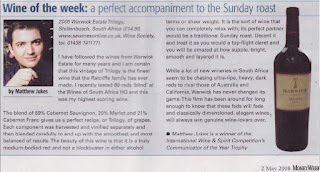 Warwick Trilogy has recently been included at position no 46 in the Wine Spectator Top 100 wines of the world for 2008. 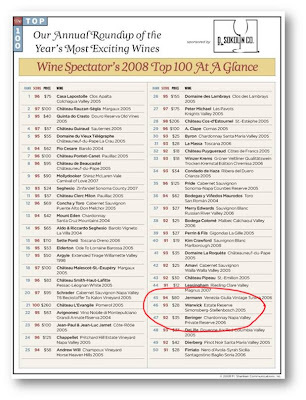 Another huge accolade after being in the Wine Enthusiast Top 100 earlier this year at position no 5! 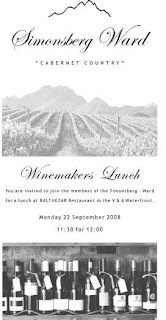 Only sad that there are no other South African wines included at this time. Pip Ratcliffe & Haidee Marklew looking glamorous! The 'Warwick Team' will be rolling out our new bags in time for the tourist season. Look closely at our plastic and paper bags for thirsty tourists to carry their booty home with them. This is by far the most economical way to get hold of a case of Warwick - as long as you are prepared to forego the obvious consumption benefits. Thanks to Jonathan Cherry for being part of our inspiration. Click here to see the original that we have copied. Love it or hate it - it is cool! GOVERNMENT WARNING: CONSUMPTION OF THE WINE PACKAGING PICTURED ABOVE CAN BE EXTREMELY HAZARDOUS TO YOUR HEALTH. PACKAGING AS DEPICTED ABOVE IS 100% RECYCLED MATERIAL BUT SHOULD STILL NOT BE CONSUMED. DRIVING WHILE WEARING THIS PACKAGING CAN ALSO BE DANGEROUS AND SHOULD BE AVOIDED. WARWICK ENCOURAGES SENSIBLE BEHAVIOUR. In conjunction with the historic Vineyard hotel in Cape Town, the Warwick and Vilafonte teams are planning the creation of a new urban vineyard on this historic site. Here is a cool video, the first of a 3-part before, during and after video archive of the event. The Opici Holiday Show was the best attended Holiday event they have ever put on for there suppliers. Special thanks to Axel Schug, James Dare, Jonathan Dreyer, and John Zelko who made there way to South Florida to pour and for all of you who participated by having your wines available for the event. Deanna and I worked the tables for those of you who could not make it and we had a great response. 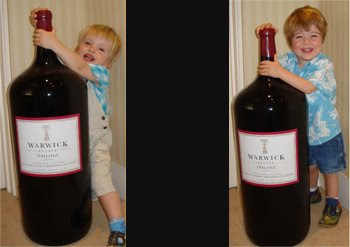 My son Charles, who has been living in London for the past 10 years, is a red-wine lover and particularly of your Warwick Estate wines. To celebrate his 40th birthday, he recently purchased these two bombs at a charity auction in London. William (right) and James, in the photo, are their twins and the youngest of our seven grandchildren. We thought you might enjoy this promotion of your product. 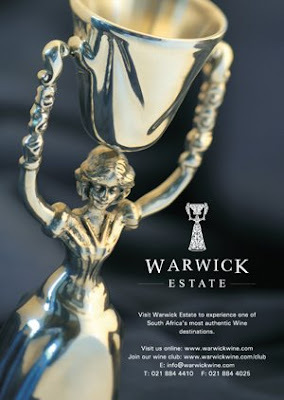 Some new pictures of the Warwick wedding cup. 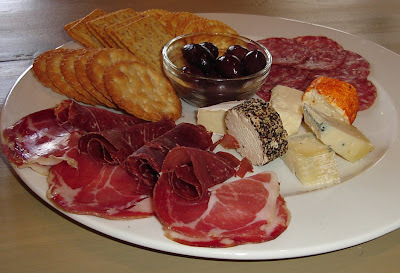 Come and enjoy our delicious farmhouse cheese and cold meat platters. These scions of great wine dynasties around the world are mindful of tradition but fearless in their pursuit of what's next. Here, writer Richard Nalley profiles the young men and women who are revolutionizing the wine industry. Laura Catena, 37, isn't just a practicing emergency-room physician with degrees from Harvard and Stanford; she's also the export manager and a pivotal player at Catena Zapata, her father's groundbreaking Argentine winery. She somehow finds time to make wines under her own label, called Luca, using formerly untapped vineyard sites to produce some of Argentina's top artisanal wines. These include the Luca Pinot Noir, made from grapes grown in a new vineyard that's a dizzying 3,710 feet up in the Andes. Vanya Cullen, 45, is one of Australia's most celebrated winemakers. Her role model is her mother, Diana, who was awarded the Order of Australia for her viticultural work. Vanya became Cullen's head winemaker only three years after graduating from Australia's premier wine school, and her skill— in bottlings like the finely balanced Diana Madeline Cabernet Sauvignon Merlot—has made her tiny winery a cult favorite. Johannes Hirsch, 34, recently made the brave decision to bottle all Hirsch wines with screw caps, from the less-than-$20 "Veltliner #1" to the spicy, racy $45 Zöbinger Heiligenstein Riesling. It's a stand for quality—no more cork-tainted bottles—like his decision to hold his wines until maturity, often in September, rather than send them out for an easy sale during Austria's spring wine-release hoopla. 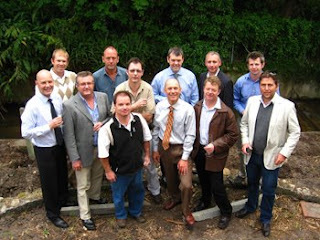 Hirsch is a serious winemaker, but he isn't humorless—witness his screw-cap monocle at right. In France's Rhône Valley, known for powerhouse reds, winemaker Yves Cuilleron has earned an international following for his minerally Condrieus and perfumed Saint-Joseph whites. Now 43, he acquired Cave Yves Cuilleron from his uncle in 1987, creating, after only three years, wines like his exotic, honeyed Condrieu Les Chaillets. It's made from the same vineyard that supplies part of the blend for Deux C, the groundbreaking transatlantic Viognier he co-produces with California's Cold Heaven Cellars—half of the wine is made in France, half in the United States. His family sold Bordeaux's fabled Château Cos d'Estournel in 1998, but fourth-generation scion Jean-Guillaume Prats was asked to stay on. In 2000, at 29, he became CEO, and began working on his vision for a more "modern" wine. Early next year, he will debut an affordable, high-caliber Bordeaux, Goulée, with Cos's owner, Michel Reybier; this year he's working with his father and Hubert de Boüard de Laforest of Château Angélus on a South African joint venture. In 1991, when 20-year-old Christophe Sabon took over the winemaking at Domaine de la Janasse, the winery his father, Aimé, founded 18 years earlier, it marked the start of Janasse's rise to the top ranks of Châteauneuf-du-Pape producers. Aimé stepped aside to concentrate on the organically farmed vineyards, leaving Christophe free to vinify some of the Rhône's most layered and elegant expressions of Grenache-based reds, like the magisterial Chaupin bottling, harvested from a sandy, tiny-yield vineyard planted in 1912. Jérémy Seysses grew up at the famed Domaine Dujac, founded by his father Jacques in 1967; now 30, he is increasingly setting its course, using vineyards that include parcels in five grands crus to produce remarkable Burgundies like Dujac's Clos de la Roche. In 2000, father and son founded the négociant Dujac Fils & Père, which Jérémy oversees—when he isn't making wine for Domaine de Triennes, the family property in Provence. The small estate-based Champagne house of Vilmart was founded in 1890, but only when Laurent Champs took over in 1997 at age 28 did its wines become shockingly good. Champs began fermenting and aging portions of the wine in new oak barrels; he also implemented labor-intensive biodynamic vineyard methods. As a result, Vilmart's primarily Chardonnay Champagnes, like the great Coeur de Cuvée, have a shimmering, silky smokiness that's unmistakable. Thomas, 39, and Oliver Haag, 32, are moving beyond the fame their father, Wilhelm, has brought the family's 400-year-old Fritz Haag estate. Oliver—who helped whip well-known producer Wegeler's storied Rheingau estate into shape—now shares winemaking duties at Fritz Haag with his father, creating concentrated Rieslings, like the top-of-the-line Brauneberger Juffer-Sonnenuhr. In 1997, Thomas acquired the Schloss Lieser estate, where he'd been the winemaker, and has since returned this Mosel property to its former glory. Mihalis Boutaris, 30, uses Greece's great native Xinomavro grape to produce powerful, modern red wines—leading the way in the current Greek wine renaissance. Working with his celebrated winemaker father, Yiannis, at the family's Ktima Kir-Yianni estates, Boutaris has gained international attention for bottlings like the robust, raspberry-tinged Xinomavro-Merlot blend, Yianakohori. Philipp Wittmann wins the German wine trifecta: The 31-year-old fashions delicious dry Riesling and dessert wines from a family estate that dates back to 1663; he's championed obscure grapes such as Albalonga, using it to make a sensuous, luxury-priced dessert wine; and he's been instrumental in bringing the country's Rheinhessen region to international prominence with such Rieslings as his sleek, racy Westhofener Morstein Spätlese. Marco Caprai took charge of his family's Arnaldo Caprai wine estate in 1989 at 21—and within a few years made the sleepy village of Montefalco and its little-known local grape, Sagrantino, famous. His viticultural research revealed that the grape contains more flavor compounds than any other in Italy; his winemaking prowess helped transform that intensely spicy fruit into prized bottlings like the Sagrantino di Montefalco 25 Anni. Marco Bernabei is leading Italy into the future by taking it back to its past. The son of famed wine consultant Franco Bernabei, Marco, 28, is a Tuscany-based agronomist with a passion for uncovering the most authentic native vine material—the preeminent Vernaccia of San Gimignano, Grechetto of Todi, and Verdello of Umbria. He's also a sought-after consulting winemaker, working together with his father at wineries like Mormoraia, Castello di Corbara and I Sodi. Dirk Niepoort, 41, is a revolutionary in Portuguese wine. The descendent of a centuries-old Dutch port-producing family, Niepoort runs an import-export company with his partners, is one of the leaders of the collective that makes the wonderful Lavradores de Feitoria table wines, oversees his family's top-notch ports, and makes what is arguably Portugal's greatest red, Batuta. In 1981, when she was nine, Sara Pérez's winemaker father dragged the family to live in the mountains of Priorato. A few years later she began helping out in his Clos Martinet winery, and by her early twenties, she had begun to make its wines herself. Now one of Spain's most sought-after consulting winemakers, she produces high-end wines for Catalan producers, as well as her own Venus, a robust Cariñena-Syrah blend that has helped put Spain's Montsant region on the world wine map. Ales Kristancic, 37, has done more than anyone to make Slovenia one of the world's most promising wine regions, combining organic farming with the latest technology to create his attention-getting Movia whites, like the acclaimed Veliko Bianco. A blend of Ribolla Gialla, Chardonnay, Sauvignon Blanc and Pinot Grigio, it's aged for at least two years in Slovenian oak, a span that would mummify most other whites, yet the Veliko emerges full-bodied, complex and intriguing. Telmo Rodriguez, 42, is Spain's leading advocate for the resurrection of native grape varieties. He started early: In 1989, while at the University of Bordeaux, he began helping to make wine at Remelluri, where his father, Jaime, was producing one of the first single-vineyard Riojas. Today Telmo produces a wide range of wines, including his own broodingly dark Rioja, Altos de Lanzaga. The most renowned Spanish winemaker of his generation, Alvaro Palacios, 41, started his career when his father, Jose, essentially tossed him out of the family winery, Rioja's Palacios Remondo. Palacios headed east and revitalized the Priorato region with his Finca Dofí and L'Ermita, then did the same in Bierzo. In 2000, he was called back to the family winery, where he has remade Palacios Remondo into a top Rioja producer. 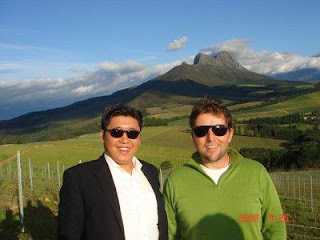 Despite being only 32, Mike Ratcliffe of Warwick Estate is one of South Africa's foremost wine statesmen, leading the charge for a forthcoming label designation, "Cape Blend," for reds containing his country's signature Pinotage grape. 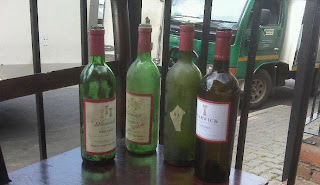 At Warwick, which his family founded in 1964, Ratcliffe uses cutting-edge technology like satellite imaging to make wines with an Old World classicism, such as the opulent Cabernet-based Estate Reserve. Joe, 36, and Steve Dutton, 38, grow grapes in Sonoma's Russian River Valley, and cult wineries like Kistler and Patz & Hall vie for their Dutton Ranch fruit. But both brothers, who inherited their holdings from their late father, Warren, also make their own wines. Joe founded Sebastopol Vineyards in 1995, then Dutton Estate in 2002; his Warren's Reserve Pinot Noir is a standout. At Dutton-Goldfield, Steve co-produces silky wines like the Devil's Gulch Pinot Noir. Though Quilceda Creek in Snohomish, Washington, was known when Paul Golitzin, 35, took over as winemaker in 1992, its rise to fame parallels his career there. His talent may be genetic: Paul's father, Alex, made great Cabernet and founded Quilceda Creek at the urging of his uncle, California legend Andre Tchelistcheff. Quilceda Creek has stayed small—the winery, with its copper-colored dome, built in 2003, produces only about 3,400 cases a year of its dense yet complex flagship Cabernet Sauvignon. Chris Figgins, 31, makes the wine everyone wants but few ever get. The waiting list at his family's Leonetti Cellar in Walla Walla, Washington, is more than 1,000 names long—all eager to acquire a single bottle of Figgins's monumental Cabernet Sauvignon. But Figgins isn't coasting: Recently he supervised the development of Leonetti's new Loess Vineyard, and he also started planting 55 more acres for a future project he'll oversee. Star of television commercials and print ads, Gina Gallo, 38, is one of the most famous winemakers in America, which would have pleased—and surprised—her late grandfather Julio. She and her vineyard manager brother Matt, 42, have redefined global wine giant E & J Gallo. Their Gallo of Sonoma division has given the family its first major presence in high-end wine, earning particular acclaim for the flagship Estate Cabernet Sauvignon. Its $60-plus price tag also might have surprised—and pleased—grandpa. The Pisoni brothers are turning one of America's great vineyards into one of its great wineries. Their father, Gary, laid the groundwork in 1982, buying unpromising land in the Santa Lucia Highlands and building it into a grand cru–worthy vineyard. But it took winemaker Jeff (left), 26, and business manager–grape grower Mark, 28, to go beyond selling grapes and create a Pisoni label, releasing the voluptuous Estate Pinot Noir in 1998. Then they got to work on dad's new label, Lucia, which debuted in 2000. In a short time, Kirk Venge, 29, has become one of Napa Valley's most in-demand winemaking consultants, making stellar wines for clients such as Bacio Divino, Fantesca and Macauley. 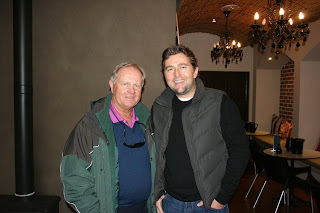 His father, Nils, provided a good example, both as a consultant and at his own small winery, Saddleback Cellars. The two joined forces for their latest project: the new Venge Vineyards winery, which opened in 2003—a year in which its flagship Oakville Cabernet Sauvignon shows its classically rich, olive-touched character. Click on this link to hear the wonederful interview and Cabernet Franc review by Michael Olivier and John Fraser on Classic FM in South Africa. 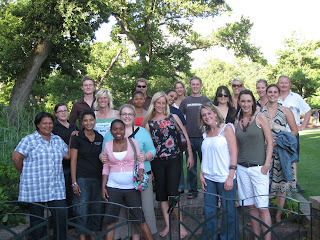 The first South African Wine Bloggers Braai was held here at Warwick and proved to be a great success! 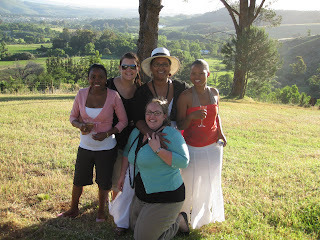 Lanie Janie and her tasting room team did a fantastic job of ensuring that the wine and evening flowed smoothly and freely. Ronald our resident 'Braai Master' cooked everyone's meat to perfection, we had a blind tasting and Mike, to everyone's demand, even told the story of Prof Black! 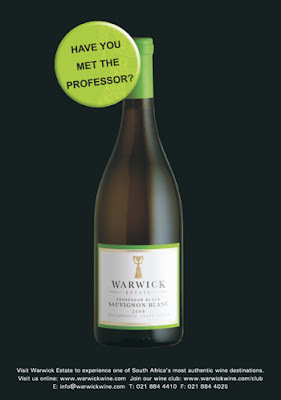 At one stage in the night a guest said that the Prof Black Sav Blanc was so good, it tasted like 'mothers milk'! It was a great evening and hopefully there will be many more to come! Warwick proudly played host to an old friend and very important South African dignitary yesterday. 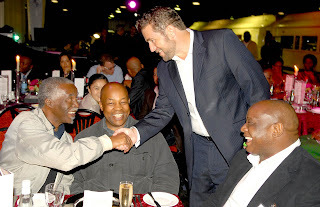 Can you guess who the person in blue is and what role he plays in South African governance? You may recognize the "First Lady" in the middle of the picture too! When you're harvesting by hand, the importance of teamwork becomes paramount to creating efficiency! 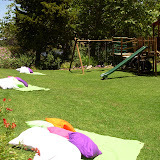 Nominations for the SA Blog Awards 2008 are now open! We would love it if you could take a few moments of your time to nominate us in the "Best SA Blog about Food & Wine"! They are all a great read, so give them a go and decide for yourself - in the meantime,thanks again for your support! Welcome to 'Harvest 2008' here at Warwick Wine Estate - here's a video to take you right into the heart of where it all begins : the vineyard! 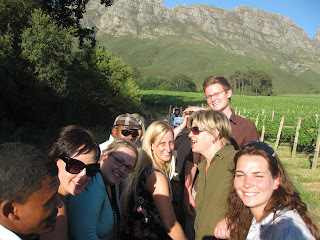 RonViti takes us through a tasting of the Bush Vines Pinotage - from the vines themselves - take a look! 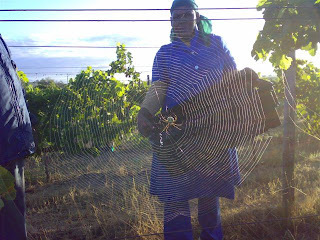 'Harvest 2008' has begun here at Warwick Wine Estate! In the words of Ronald our viticulturist (RonViti) , "the grapes are looking great and we are seeing some fantastic, healthy bunches coming in" - we are no doubt very excited about the vintage! In an effort to bring you closer to the heart of the effort and people involved in creating your favourite Warwick wine - we will be bringing you a series of videos highlighting this years harvest! You'll see everything from where in the vineyard the grapes came from, the tractors used to transport them, the berry sorting process and you'll even see us filling up the barrels! And who knows - you may even catch a glimpse of our famous "Wedding Cup" in one or two of the videos - in which case there may be some sort of reward (so keep your eyes glued!)! 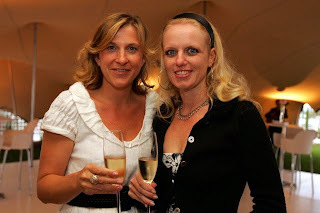 We hope you find them entertaining and informative - above all we hope that you feel a connection with the estate, the wine and the people who are so passionately involved! 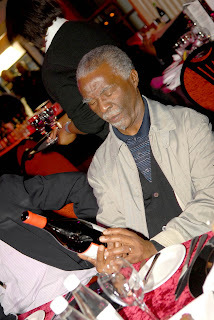 Warwick was selected as the 'official' wine for the State Presidents Intternational Investment Council dinner in george in December 2007. Here is a picture of Mike welcoming the president and then a great second picture of the president 'inspecting' the goods - so to speak! Warwick 'Old Bush Vines' Pinotage which went down a treat!